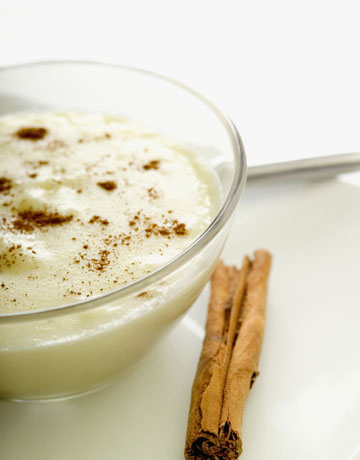 Rice pudding is possibly one of those meals that kids really don’t like. But this one is very tasty and even fastidious child will enjoy it. As you know rice is rather nourishing, but at the same time each serving contains only 244 calories (it’s not that much for rice), 109 mg cholesterol, 43 g carbohydrates, and 200 mg sodium. Boil water and cinnamon stick in large saucepan. Add rice. When it’s tender discard cinnamon stick. Add milk and salt and make it simmer for 15-20 minutes. When it’s cool stir in Equal®. Combine egg yolks, egg whites, and vanilla in a small bowl. Do not add this mixture directly into rice. Mix it first with 1/2 cup of rice, and then with the rest of it. Cook for a couple of minutes more.